75-year-old Nigeria President Muhammadu Buhari dey healthy pass than 80% of Nigerians. Dis na wetin wan current Minister for di West African kontri declare although di reason im tok so fit surprise many. 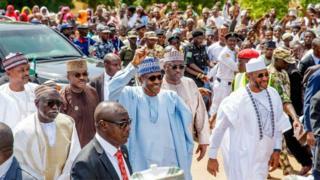 Minister of Labour and Productivity Dr Chris Ngige tok dis one for Awka, Anambra state wia im compare oga Buhari to 93-year-old Malaysia leader Mahathir Mohamad wey dem elect dis year. Dr Ngige say di Nigerian president dey physically and mentally strong to rule. "I go tell you as a medical doctor of over three decades wey I be, say Mr President dey physically and mentally healthy. Im healthy pass 80 per cent of Nigerians," tok Ngige wey neva practice medicine since di 2000's wen im leave di profession to enta politics. Di fact be say, although Ngige be doctor, im no be Buhari doctor - many even believe say Buhari doctor no even dey Nigeria, but dat na tori for anoda day. So how e be say im fit beat chest tok dat kain tin wen im no get medical record of oga Buhari and all Nigerians for hand? Di ansa fit dey inside how di former Anambra State governor don dey monitor how long Buhari dey sidon ontop chair. "Im (Buhari) dey sidon for more than eight hours inside our executive meetings. Wen some of us go dey go for break to stretch our legs, Mr President go sidon on im chair tey, and na only water im go drink". So, make we look at di facts of how e fit true say Buhari healthy pass 150 million Nigerians (dat na 80% of total population on 186 million). Sabi pipo say 60 percent of Nigerians dey under 30 years of age. Dis mean di number of pipo wey Ngige claim say Buhari get good health pass na at least 100 million Nigerians wey just dey start life. Moreover, di average life expectancy age of 54 (according to WHO) go favour young pesin under 30 pass pesin wey don pass 70. Even though pipo no sabi wetin dey inside Buhari medical record because e no dey public, di number of times for recent years wey di Nigerian president don abandon medical treatment from im kontri doctors go abroad, make some Nigerians worri. But di real question wey pipo suppose dey ask be say why Minister Ngige no ask im imsef: how come 75-year-old leader of a kontri dey healthy pass plenti young pipo e dey lead? How come di leader dey get di kain healthcare wey many of im pipo no ever fit enjoy? Shey im colleagues wey dey go stretch leg for meeting with di president, be fellow old pipo or part of di young 100 million plus Nigerians under 30?